The Mediation Confidentiality Bulletin describes the legal and practical considerations for state agency participation in confidential mediations. ORS 36.220 to 36.238 authorize state agencies to make mediation communications confidential. The statutes also allow agencies to limit the discovery and admissibility of mediation communications in subsequent proceedings. Except for certain workers compensation mediations, the confidentiality and inadmissibility provisions of these statutes are available to state agencies only by adopting, mediation confidentiality rules developed by the Attorney General. ORS 36.220 through 36.238 authorize state agency participation in a confidential mediation. For most agencies, the confidentiality and inadmissibility provisions of this law are available only by adopting rules developed by the Attorney General pursuant to ORS 36.224. The Attorney General has developed two mediation confidentiality rules: A rule for the mediation of workplace interpersonal disputes and a rule covering most other mediations. Agencies may adopt either rule or both rules. With the passage of SB 189 (2015) » the adoption of mediation confidentiality rules has changed. This webpage explains those changes. The most current rules were adopted on October 27th, 2015 and can be found below. See 137-005-0050 » regarding the process for adoption of mediation confidentiality rules. Many state agencies adopted mediation confidentiality rules prior to the passage of SB 189 (2015). See List of Agencies below. Agencies that have previously adopted mediation confidentiality rules may still rely on those rules. In order to comply with ORS 36.224 as amended by SB 189 (2015) the Attorney General adopted temporary mediation confidentiality rules 137-005-0052 and 137-005-0054 and amended model rule 137-005-0050 on May 22, 2015. These temporary mediation confidentiality rules are substantially similar to the previous mediation confidentiality rules in 2014. As noted above, agencies who adopted a mediation confidentiality rule prior to May 22, 2015 may still rely on those rules. The following list is provided as a convenience and no assurance is made as to its completeness or accuracy. 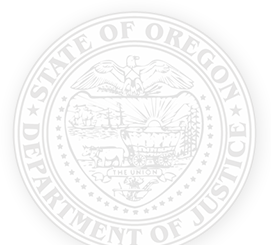 For the most current version of agency administrative rules see Oregon Secretary of State – Administrative Rules ». The following template was prepared by the Department of Justice for use by its client state agencies. This “Version A” is intended for use in mediations in which an Oregon state agency is a party, at least one non-public body entity is also a party to the mediation and an independent third-party is the mediator. It assumes that the parties are seeking the maximum confidentiality available and that all state agencies who are parties to this mediation have adopted mediation confidentiality rules as required by ORS 36.224.